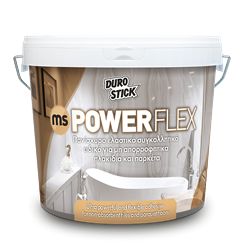 Powerful one component flexible adhesive based on modified silane resins. Once it cures, it remains permanently flexible and is able to absorb shocks. Ideal for installing large size non-absorbent ceramic tiles (1.60x3.20m, 1.20x2.40m, 1.20x1.20m, 0.60x1.20m), on surfaces that are also non-absorbent. Also suitable for installations over radiant heating floor systems. Recommended for installing all types of parquet floors (solid, laminate, etc. ), as well as small and large wood boards. Ideal for vinyl strips (LTV) as well as sports flooring materials and PVC rolls installed on flat surfaces (marble, tile or mosaic), without the need for levelling the application substrate. It is only necessary to completely fill the grout joints with the epoxy grout DUROPOXY. 1,4-1,6kg/m2, depending on the coarseness of the surface. 12kg plastic container (With two air-tight aluminum bags of 6kg each one).